About eight hours after our memorable meal of num ban-chok we return with our resourceful tuk-tuk driver Hak (you can find him hanging out with his machine in front of Siem Reap's most achingly hip hotel) to Pradok village to see just where our breakfast noodles had come from. Brief inquiries lead us to this house, the face-to-the-road of a compound of 5 or 6 similar wooden structures shared by a large extended family. 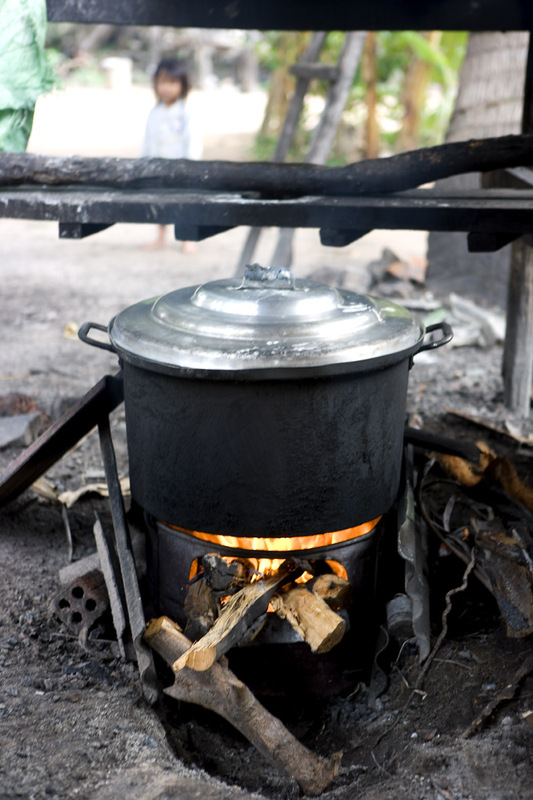 The only sign of food preparation is a huge pot on the fire, but the lady of the house and head of the family confirms that we'd come to the right place. 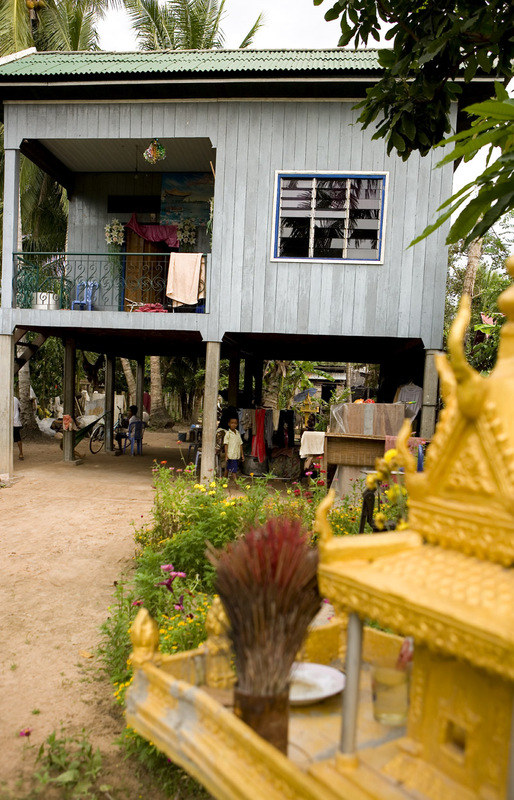 'After the Khmer Rouge I had nothing. No land, no rice, no food. My family needs money. So I make num banh-chok to sell,' Madame Moul tells me, with Hak translating. That was thirty years ago. Now she and her daughter-in-law work together,making the noodles each day to sell to vendors who take them to Pradok's small crossroads market. 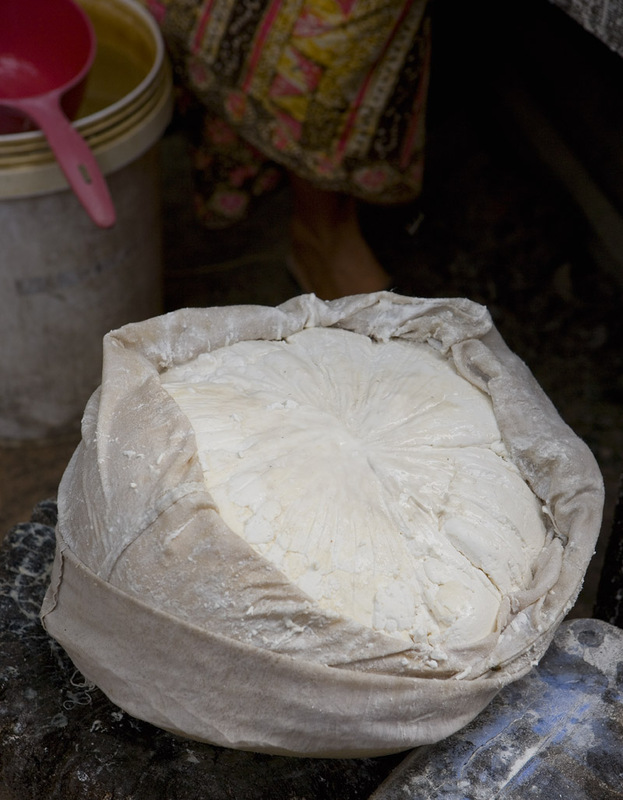 Num banh-chok is made from rice that's boiled until soft and then ground into a liquidy dough with a heavy stone mill. 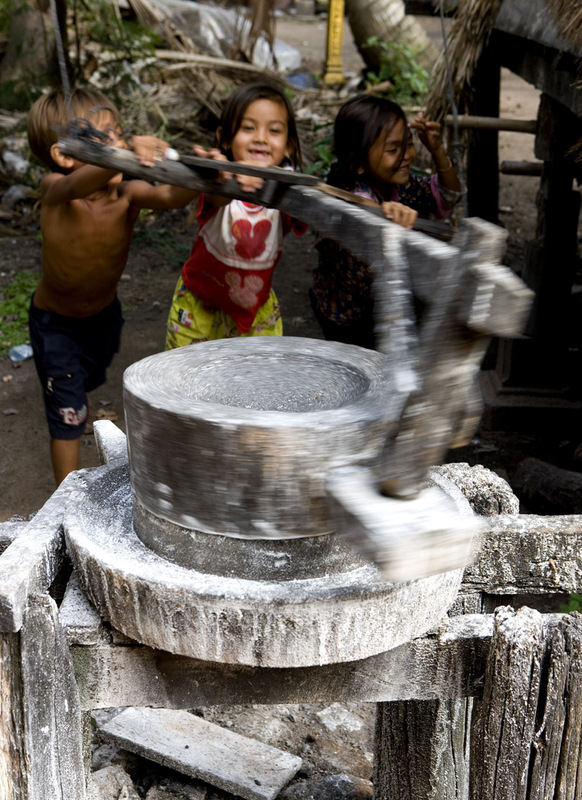 We missed this part of the process but a few of Madame Moul's grandkids are more than happy to whip themselves into a frenzy demonstrating how the mill works. It's turned round and round with a lever that attaches to the upper stone piece. 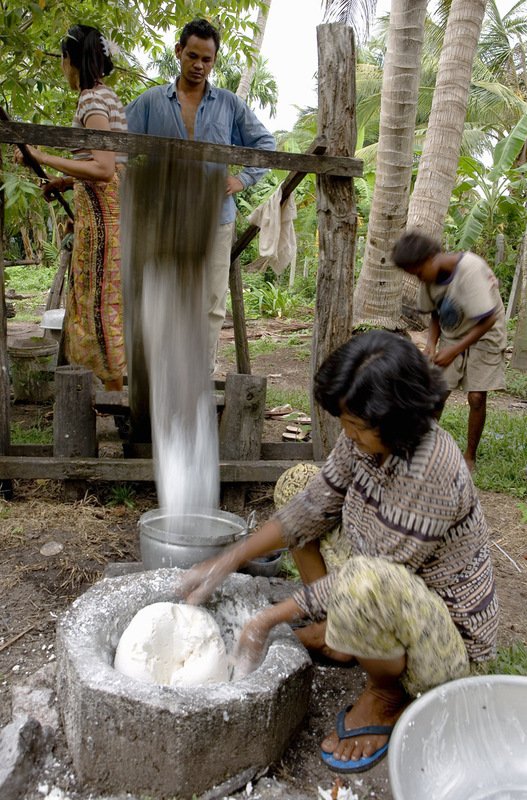 After the rice is ground the wet batter is placed in a cloth bag and heavy weights - mill parts, in fact - are placed on top to squeeze as much water out as possible. 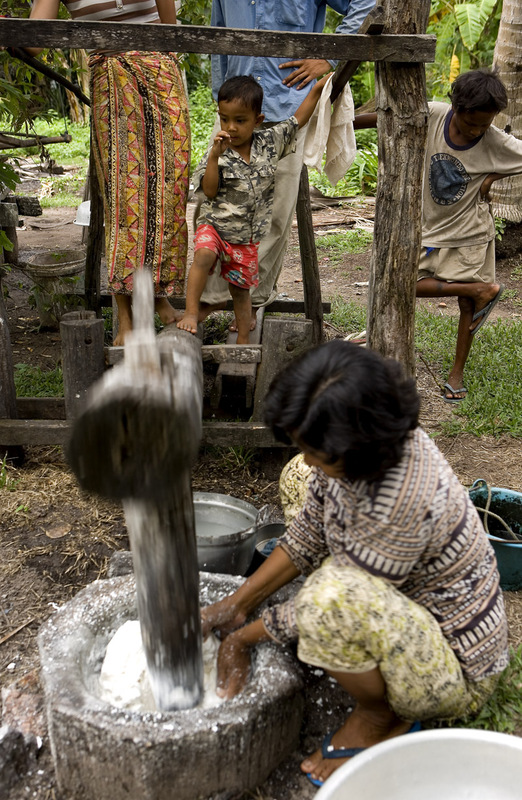 During this time the rice begins to ferment. 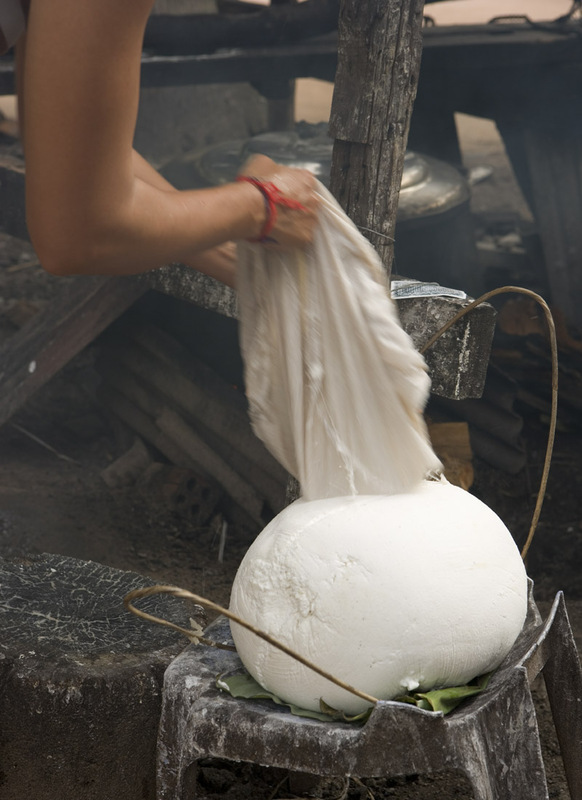 The result is a sort of very firm, dryish-but-sticky flour that needs to be softened in boiling water before it can be transformed into the smooth dough - or batter, if you wish - from which the num banh-chok are formed. and then repeatedly slamming the it onto a tree stump, rotating it the bag a bit each time. 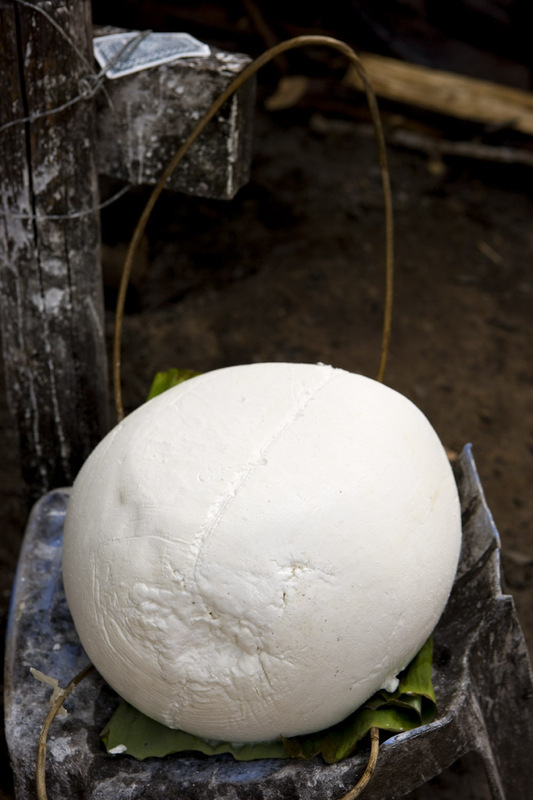 When she's finished the dough resembles a huge ball of fresh cheese. and after about 30 minutes it emerges rock-hard and a starchy-slick to the touch. Now it's ready to be pounded in a large, deep rock mortar with a pestle that's worked with leg power. This is where Madame Moul comes in. 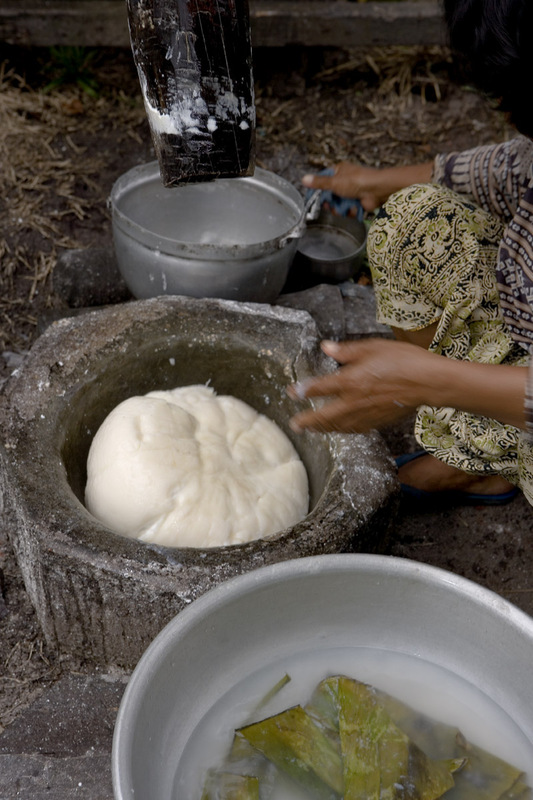 First she places the dough ball into the mortar. 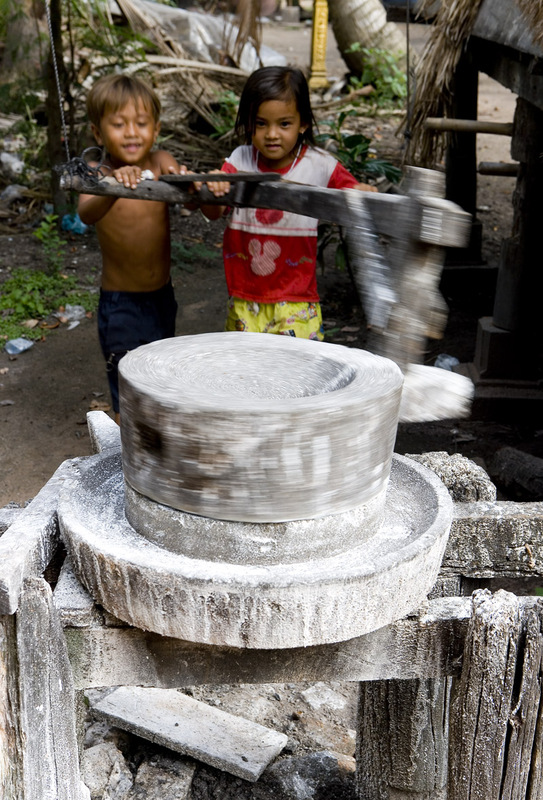 With a few light taps of the pestle the dough lump splits in two. Only one half will be pounded at a time, so Madame Moul transfers the other back to the bowl. 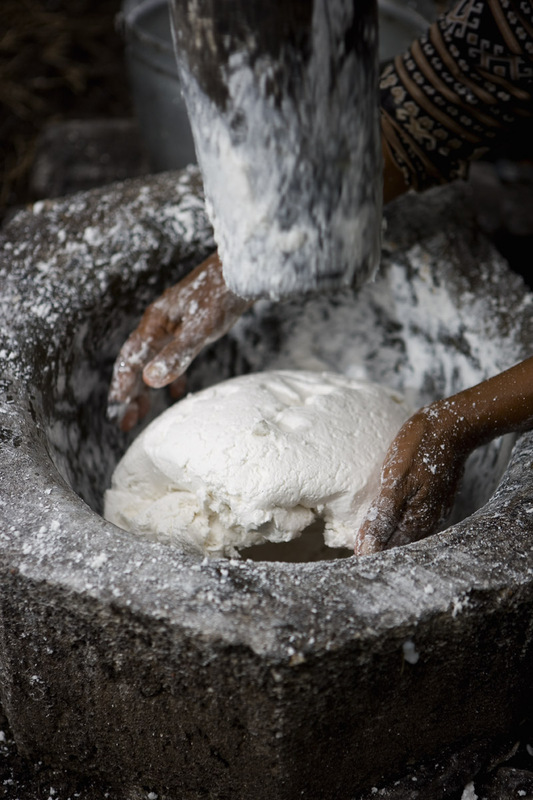 Assisted on occasion by her husband and/or son, Madame Moul's daughter-in-law pumps the lever attached to the pestle as Madame Moul constantly turns the dough in the mortar, exposing all sides to the pestle's force. 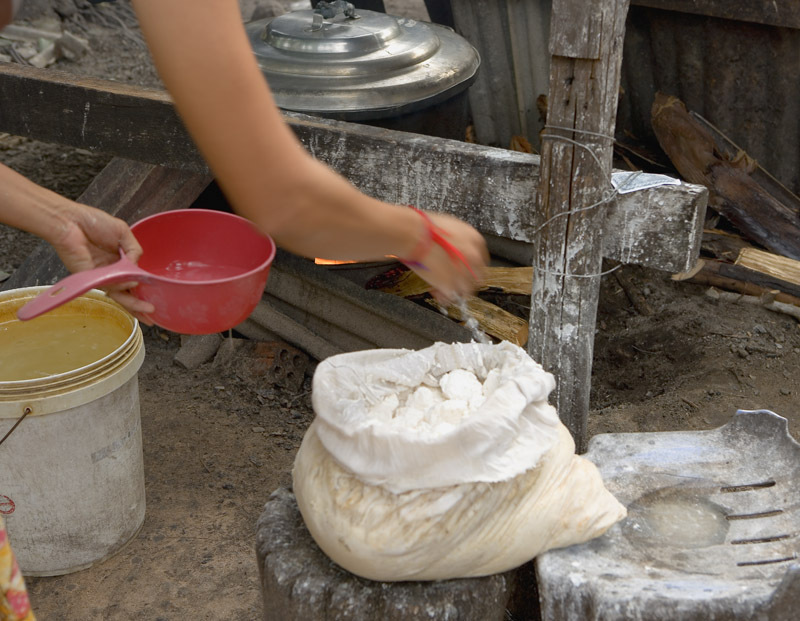 As it's being beaten the dough gives off a strong, sour, yeasty smell (a result of the mild fermentation that, we suspect, gives num banh-chok its special chewy elasticity). 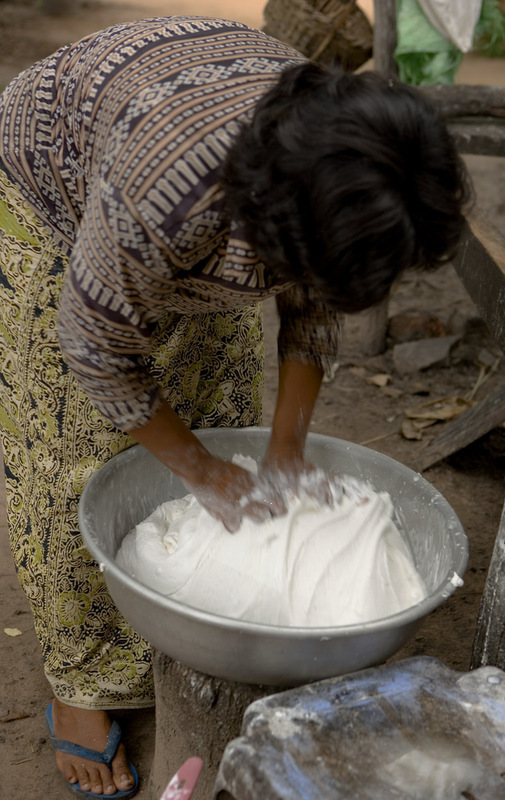 Over the course of about fifteen minutes the dough is transformed from a rock-hard, floury ball to a smooth, elastic dough. Toward the very end Madame Moul softens it by sprinkling on water. 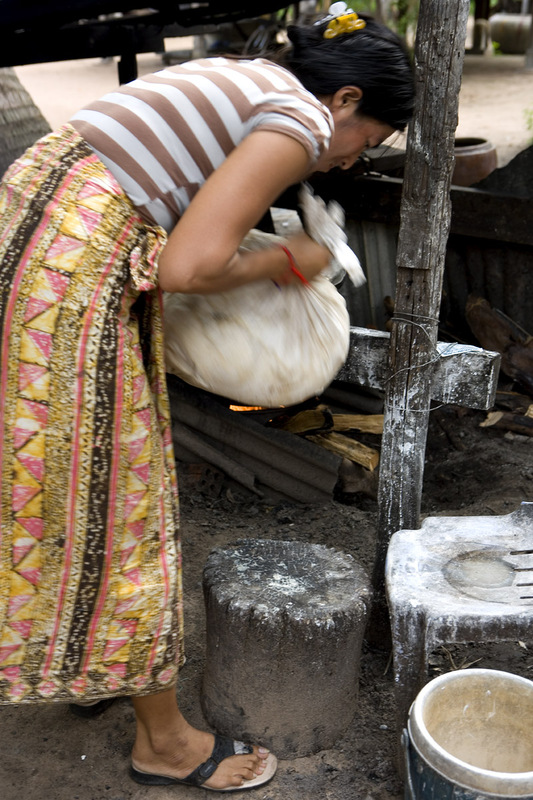 Back by the pot on the fire, she kneads it further by hand, adding still more water. When she's done its snow white soft peaks remind me of vanilla Tastee-Freeze twirled in a cone. Read the rest of the story in Num Banh-Chok, Rice to Noodle Part Two, here. This is amazing! 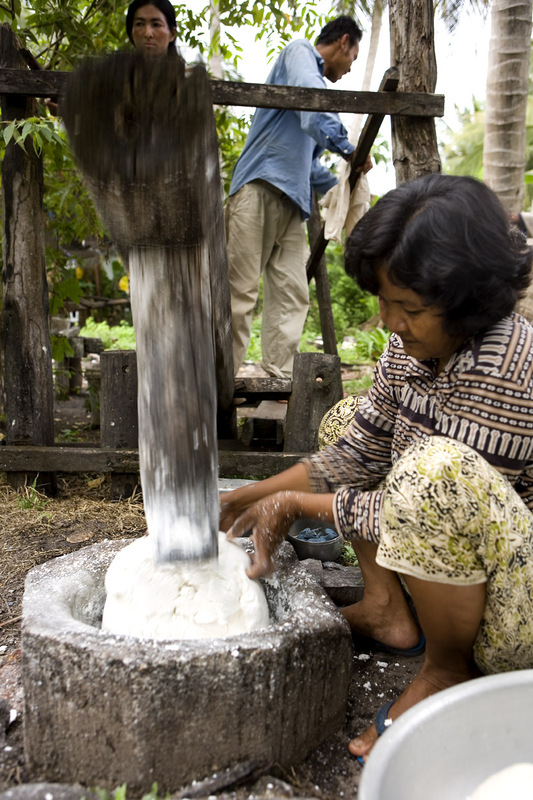 How long does the rice ferment for, with the mill parts on top. I know this might sound bonkers, but I might try this at home albeit on a much smaller scale. depending on how difficult the actual noodles are to make that is. I cant wait for the next installment!!!!!!!! How fun to be able to watch that process. I love it when you guys show how things get made especially in this part of the world where everything still has the human touch. Wonderful! Thank you for letting us share in the experience. Can't wait for the rest. I hope you arent going to start doing these two part posts! The suspense is killing me! I've never eaten Cambodian food, but I do love rice noodles. Its really interesting to see how they are made. Thank you for sharing these wonderful photos. 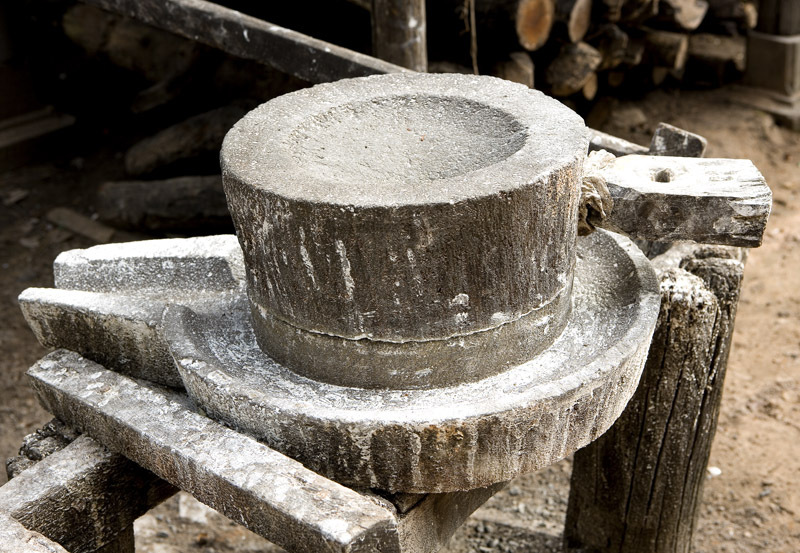 I love mortar and pestles. I've never seen one so large. I hope to see this in person one day. Thanks Robin for the post. 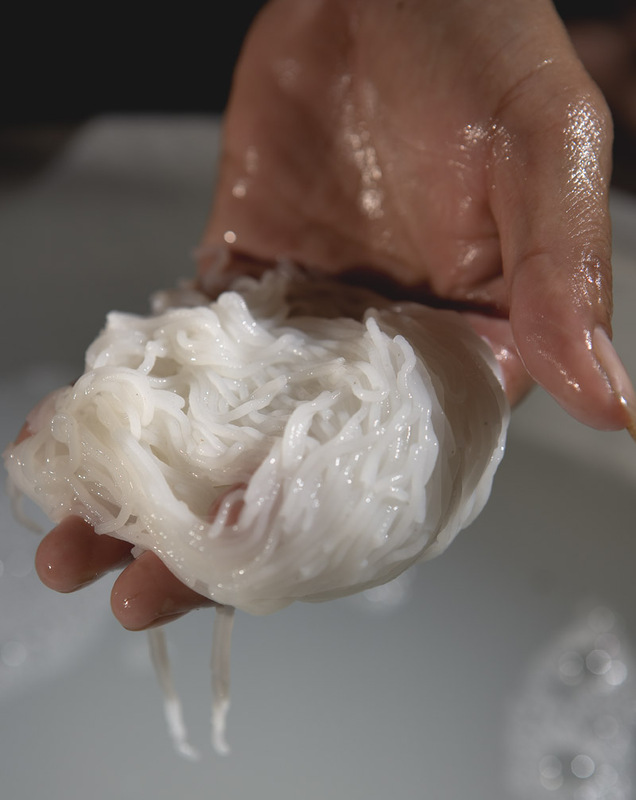 I love rice noodles and never thought that it is that hard to make. 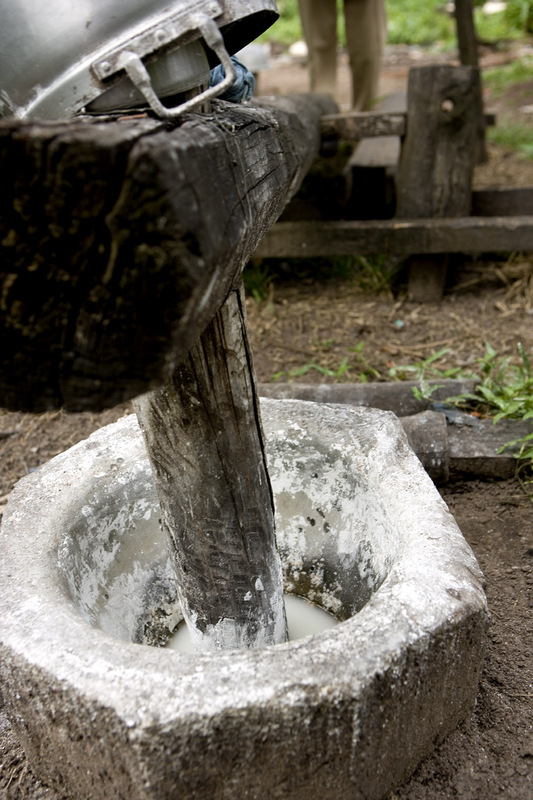 The mortar and pestles are similar to what my grandmother used to use to pound rice albeit it was all wood. As a child I love to help at the other end, going up and down. I do not know if villagers in Malaysia still use them since machines are widely assessable. luckyfatluke - it's about 10-12 hours. 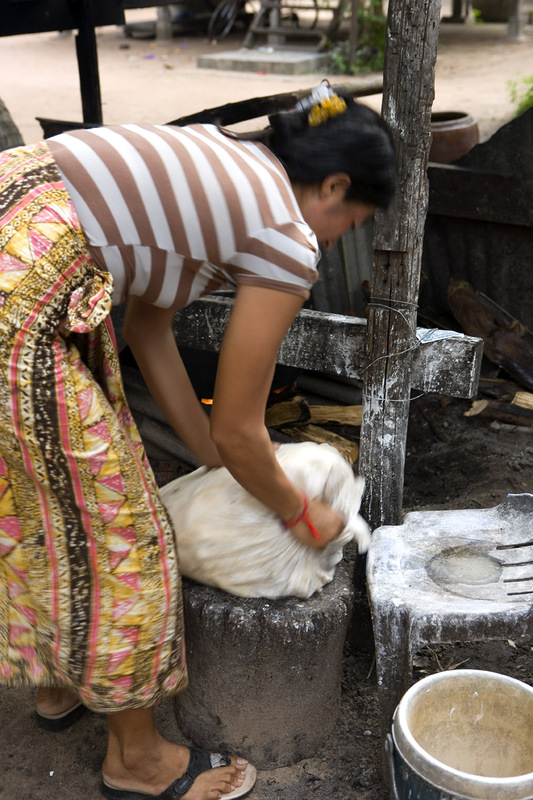 They make the rice flour/dough v. early in the morning, before dawn, and then proceed with the noodles about 5pm. And two-part posts won't be the norm -- only when the number of photos gets unweildy. Jennifer - I love mortars and pestles too, have a little collection going. No place in my kitchen for one this big though! Hi Saida, thanks for sharing that memory. I doubt they are still used in Malaysia but I suppose you never know. Some rice noodles are much easier to make than this, really more a matter of just making a batter and steaming or boiling. I think the fermentation stage greatly complicates the process.